“The Visit” is the latest horror film to hit our screens and whilst it isn’t perfect, it definitely offers some real scares. On the surface this film has two major issues; the first is that it utilises a found footage format which audiences are becoming increasingly frustrated with, and the second is that it was written and directed by M. Night Shyamalan. However, these issues fade away as the film hits its halfway point, with endearing and off-kilter performances capturing the audience’s attention, and the found footage format used to facilitate genuine character development rather than simple jump scares. Personally, I think that Shyamalan gets a rough time of it from critics, because although he’s made some awful movies he’s also responsible for some real gems. His filmography is one of inconsistency rather than incapability, a mixed bag with “The Sixth Sense” and “After Earth” acting as two ends of a very strange spectrum. It’s crazy that the same person is responsible for both, but at the end of the day every director has one or two bad films on their resume. Here Shyamalan is at his brilliant best, returning to the genre that made him famous – psychological horror. “The Visit” is about two children, Becca (Olivia DeJonge) and Tyler (Ed Oxenbould), as they visit their grandparents, Nana (Deanna Dunagan) and Pop Pop (Peter McRobbie), for the first time. Initially the pair warm to their grandparents and everyone gets along, even though Nana and Pop Pop are a little odd, but things take a disturbing turn when Becca breaks the 9:30pm curfew set by Pop Pop. From there things only get more unsettling and the film begins to whittle away at the audience’s nerves with each night that passes. The reason that found footage comes into play is that Becca is an aspiring filmmaker, who sets out at the start of the film with the goal of making a documentary for her mother, played by Kathryn Hahn, to earn her forgiveness from Nana and Pop Pop for an event which happened fifteen years ago. It’s an interesting way to integrate a home movie feel into the film and it’s one that is constantly reaffirmed by Becca’s actions, as she makes repeated references to the way she wants things to be shot and certain lines to be said. Although there’s no reason in particular why the movie wouldn’t have worked better in a typical format rather than as a found footage pseudo-documentary, the way the movie was filmed didn’t break my immersion. The surprising thing about this movie is that it has a great sense of humour. The first trailer I saw for “The Visit” made me laugh, but not for the right reasons; I just thought it looked ridiculous! I was expecting some sort of bizarre supernatural story whereby two grandparents had become vessels for the devil, or perhaps Nana was trying to fatten up the children so she could eat them for supper. However, having seen the film it’s very obvious that the silliness in the trailer was intentional, and whilst the movie is a bit wacky, it’s meant to be that way. The film doesn’t have a supernatural element as the trailer suggests, instead it has a firm grounding in mental health, ageing, and losing your connection to your family. The first two themes listed here are obvious given the nature of Nana and Pop Pop, as both are in their later years and a little bit loco. The movie blurs the lines between the two, intertwining one with the other as Becca and Ed attempt to rationalise Nana and Pop Pop’s behaviour. The latter, on the other hand, relates more to the children’s loss of a father figure, and also their mother’s separation from her parents. This is a clear motivation for Becca and Ed and also for their mother, as perhaps the only reason why she agrees to let them stay with Nana and Pop Pop in the first place is that she’s a single parent struggling with the pressures that come along with raising teenagers, along with the fact that she feels guilty for her part in denying them an important figure in their lives. “The Visit” is about real issues that people face on a daily basis and how attempting to cope with them can lead to painful and sometimes horrific situations, which in my opinion is what sets it apart from most found footage horror films. In addition to a strong script with a surprising amount of depth, “The Visit” is elevated by two creepy performances from Deanna Dunagan and Peter McRobbie, who are both deeply unnerving. Nana is clearly the more sinister of the grandparents, not only because her spindly frame and ghost-like complexion remind us all just how frightening little old ladies can be, but also because when she isn’t acting like a woman possessed she’s incredibly calm and straight faced. When she isn’t running around the house or scratching at the walls she looks at the children with eyes that seem lifeless, devoid of affection and joy, meaning that no matter what she’s doing she appears to be ready to attack. She’s simply menacing, to a degree that a kindly old woman should never be. Pop Pop is scary for a completely different reason. He doesn’t seem quite as crazy as Nana, nor does he chase the children around under the house like a spasming spider, but it’s clear that physically he is capable of doing real damage, and the fact that his mind sometimes seems to escape him makes that all the more disquieting. Pop Pop just never seems present, never quite there – there’s always something clouding his mind. Deanna Dunagan and Peter McRobbie make the film what it is, because they give their characters a quirky peculiarity that’s both endearing and frightening, leaving the audience wondering what on earth could be wrong with them. Olivia DeJonge and Ed Oxenbould are also very good as Becca and Tyler, and they have a surprising on-screen chemistry. You believe that these two young actors could be brother and sister, as they squabble over the smallest of issues and throw playful jibes in one another’s direction, and they really seem to get along. “The Visit” is a stellar return to form for M. Night Shyamalan and a fantastic horror film in its own right. It’s a subdued affair which burns slowly, but the performances carry it through, as Nana is a truly scary antagonist and the children are very charming. It’s a smart film about ageing and the perceptions that surround it, as well as mental illness and family issues – Shyamalan at his best. “Fear The Walking Dead” is the kind of series that I wish didn’t exist, not just because it feels uninventive and cash-grabbing but because I can’t help but watch it despite knowing that this is the case! “The Walking Dead” is an incredibly lucrative show for AMC so it’s only natural that they would want to cash in by creating a companion series, but it feels a bit manipulative to have a show with “The Walking Dead” in the title when in actual fact it has very little to do with the flagship series. I would personally much prefer that a new show was created with gifted young writers and actors because AMC is already making its money with “The Walking Dead”. Instead, we have “Fear The Walking Dead” which is basically a knock-off of “The Walking Dead” but with cheaper actors and less decayed walkers. The reason that I’m tuning into “Fear The Walking Dead” isn’t just because I watch “The Walking Dead”, it’s also because I want to know how the zombie apocalypse began. How did the world react to the world coming to an end when Twitter and YouTube were still prevalent? When did the dead start turning into walkers? Like when exactly – everyone is infected in “The Walking Dead” so if Nick (Frank Dillane) had died when he was hit by the car in this episode would he have turned into a walker? When did the process begin? My interest in “Fear The Walking Dead” is clearly tied to the main show which is why I’m a bit frustrated at both AMC and myself. I don’t actually like the cast and this premiere was pretty appalling, so the fact that for some reason I’m invested is incredibly annoying. In all fairness this show has a lot going for it; it could go in a number of interesting directions because, after all, we’re witnessing the start of a zombie apocalypse! There’s so much going on in the city and there are so many people for the walkers to feast on, so the show could actually end up being pretty good if the writers can be bothered to try. Sadly, from what I’ve seen so far I have to imagine that the showrunners will take whichever road is the most travelled so that they can do as little work as possible. This season premiere began with a typical zombie cliché, as Nick searched a creepy looking building for a girl named Gloria (Lexi Johnson), only to find that she was a walker. The sound was ominous (although clearly artificial), the lighting was dim, and shrieks of panic could occasionally be heard in the distance. What could possibly be the matter? I was so disappointed with this opening because we’ve seen it before hundreds of times, and there’s no surprise when a walker appears at the start of a television series about the walking dead! Why bother trying to build suspense at all? If you’re going to immediately reveal your cards then there’s no point in bluffing. Surely nobody was actually scared by this sequence. I’m not a massive fan of jump scares, because most of the time they’re designed to shock rather than scare which gives the name a bit of a false feel. However, in this instance I would’ve been quite pleased if the opening had paved the way to a comedic one, with Gloria playing a trick on Nick rather than simply being a walker. This would’ve established that although the show isn’t going to be original, it will be fun and try to play around with genre conventions. Alas, the showrunners don’t seem to have any intention of thinking outside the box, so I don’t expect to see anything new or exciting. I don’t want to linger on the opening scene too much, but it really is infuriating that the showrunners couldn’t have thought of a better way to introduce the story and one of the show’s main characters. The showrunners could’ve done hundreds of different things with the setting of the church whilst still establishing that this is a show about zombies. They could’ve started with a drug bust, which would’ve been interesting because the sounds of panic could’ve still made the audience think that a walker was about to appear. Alternatively, they could’ve had a walker banging at the door trying to get in, with Nick believing that it was a dealer and thus leaving the area. He could’ve even seen the walker that was knocking on the door from a distance afterwards and made a joke about it looking messed up, given that from a distance it might just look like a person on a large quantity of drugs. This would’ve let the audience have a glimpse of a walker and also established some sort of personality within the show. The characters, like the opening, were completely clichéd – Nick is the stereotypical screw-up junkie and as usual he’s the only person in the main cast who knows the truth to begin with. But who would believe a junkie? Wow, how original. On top of that, he’s part of a dysfunctional family. Madison (Kim Dickens), the mother in this family, seems pretty well put together, although her son is a junkie so we’ll have to wait and see. She seems to wear the pants in the relationship with her new husband so she’ll probably be a badass like Carol (Melissa McBride) is on the main show. There’s also a daughter, Alicia (Alycia Debnam-Carey), who has a boyfriend, Matt (Maestro Harrell) – that’s going to be her character development right there. The boyfriend dies and hey presto she becomes another lost soul hardened by the world. Now I may be being slightly cynical and also a tad sarcastic, but come on, are the folks down at AMC joking? These characters are a disgrace! There’s nothing to any of them – they’re straight out of the ‘Writing a Zombie Film/TV Show for Idiots’ guide book. Beyond the issues with the writing, characters, and general lack of ambition from AMC, the performances across the board were poor. I don’t want to condemn any of the actors, because the fault isn’t really with them, but they didn’t elevate the material they were given. Frank Dillane wasn’t good at all and he didn’t show half as much emotion as was necessary when he was explaining what happened in the opening scene. He whispered through his lines and tried to make his eyes water, but the rest of his face didn’t move and he flittered from sad to indifferent like a child in a school play. 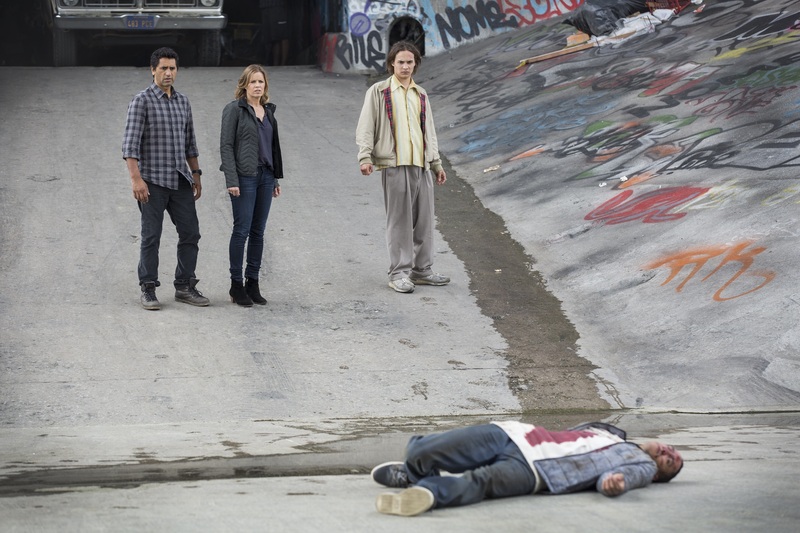 Maybe things will get better, but right now “Fear The Walking Dead” seems like nothing more than a mediocre attempt to piggyback on the success of “The Walking Dead”. Whilst the idea of gaining an insight into where the zombie apocalypse began is potentially interesting, what I saw in this premiere leads me to believe that nothing creative will be done with the premise. Overall, this premiere was incredibly dull and extremely disappointing, with very few positives to speak of. This review contains spoilers for the third season of “Hannibal”. It will mainly focus on the second half of the season. This third season of “Hannibal” has been a tale of two halves. I thought the first half was fantastic, as we followed Hannibal’s (Mads Mikkelsen) exploits in Florence and watched the supporting cast attempt to subdue him. However, the second half didn’t hit the mark as far as I’m concerned, because The Red Dragon’s (Richard Armitage) storyline was streamlined so that the show could focus more on Will (Hugh Dancy) and the way that Hannibal’s influence was impacting his personality. Nevertheless, the finale was satisfying and I believe that it was a beautifully brutal way to end the series. I’ve heard the word ‘focused’ thrown around regarding the second half of season three, but I think that evaluation is misguided. In my opinion there was actually a complete lack of focus, because while Francis Dolarhyde (The Red Dragon) was introduced and frequently visited, his story was bare and without context – I never felt as though the story was centred around him. Dolarhyde wasn’t developed at all, so although the narrative was clearer when he was involved, his involvement felt like a distraction. Dolarhyde is supposed to be a man damaged by the world, treated like an outcast by everyone other than his abusive grandmother, due to his speech impediment and physical appearance. This leads to psychological damage, which in turn leads to delusion and psychosis. None of this is clear in this adaptation because we just don’t know anything about Dolarhyde – he’s nothing more than a villain for Will to chase; a reason for him to be reunited with Hannibal. This not only took away from what I thought was a decent performance from Richard Armitage, but also ruined the character of Reba (Rutina Wesley), because we didn’t see what Dolarhyde as a man was really about. Yes, he’s a horrible killer, but he’s also lonely and has never felt real love. Reba shows him affection, and he can shed the shackles of the dragon because she can’t see him – his disability is masked by her’s, which has a certain beauty in the novel which is lost here. I feel that this is truly a shame, because if any show could’ve done The Red Dragon’s story justice it would be this one, given the show’s focus on psychology and the general intelligence which has been displayed since the start of season one. I was really looking forward to seeing The Red Dragon on “Hannibal”, because in Thomas Harris’ novel the origin of his madness is compelling, and I thought that the television show would thrive in exploring this, due to the nature of the show and also because of the amount of time available to tell the story. Sadly, we weren’t afforded any proper insight into Francis Dolarhyde’s past, so he didn’t feel like a fully-formed character. This was incredibly apparent because everyone else on the show has had three seasons to establish themselves. We should’ve felt sorry for Dolarhyde because of all he had been through, but instead he came across as a monster, and ultimately he felt like a spare part in his own story. Having said all that, I should note that I didn’t hate the entirety of the second half of season three; it’s just that my expectations were extremely high given what had come before. There were many memorable moments to take from the last half of this season, particularly Doctor Chilton’s (Raúl Esparza) gruesome treatment at the hands of the Dragon, which was harrowing even on a show about a psychologically deranged cannibal. I was pleased that the show didn’t use Freddie Lounds (Lara Jean Chorostecki) for that moment like the book did, because on the show she isn’t nearly as interesting a character as Chilton is, as she hasn’t had as much time on screen over the course of the series. I felt a great deal of sympathy for Chilton as he faced the Dragon, because although he can be despicable I don’t think he’s that bad on a show filled with morally grey individuals, he just wanted to be exceptional and never really was. The performances throughout the season have been superb, especially those of Mads Mikkelsen and Hugh Dancy, who have developed a real on screen chemistry. Their relationship blossomed into something of a love story at the end of season two, and that continued in season three. Their affection for each other was amazingly portrayed over the course of the season, especially because it was mixed with anguish due to the pain that Hannibal had inflicted on Will since episode one. Mikkelsen has a disturbing presence, controlling the screen whenever he’s around, which is even more evident when he’s appearing in scenes with Dancy, due to Will’s attraction towards him. Dancy plays Graham as though he is a super-intelligent alien visiting our world, understanding everything that’s going on around him whilst simultaneously feeling confused by it. He never seems settled or satisfied, which is perhaps accentuated by the psychological torture that he endures whenever he is around Hannibal. As the show has progressed Will has altered drastically, as Hannibal has sunk his teeth in and shown him how good it can feel to take control. To me this evolution is the essence of the show, so it was incredibly satisfying to see Will give in to Hannibal right before the end credits rolled, orchestrating his escape and also a final showdown with the Dragon. Their cooperation in taking down Dolarhyde was an ingenious way for the season to close, because it gave both characters what they wanted whilst preserving their personalities. Hannibal had shown Will what he was missing and Will had liked it, but Will also knew that if he let Hannibal escape they would both kill again. Jumping off that cliff finished the whole sordid saga, because it was the only way to be sure that Hannibal wouldn’t kill Alana (Caroline Dhavernas), Jack (Laurence Fishburne), and many more. 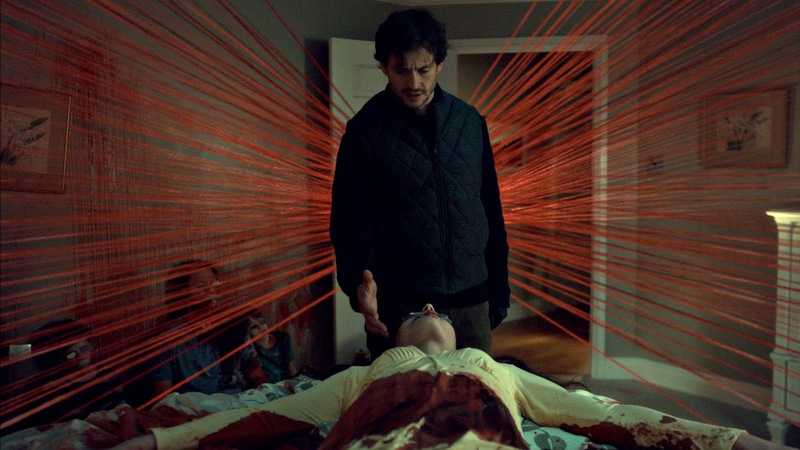 It was an almost Shakespearean finale, ending “Hannibal” in the poetic way that it deserved. All in all, “Hannibal” season three made for great entertainment, even if it was a bit disappointing at certain junctures. I loved the first half of the season, and although I felt that The Red Dragon’s story was wasted I still thought his role in the final sequence was fantastic and meant that his character felt necessary. The series petered out towards the end, so perhaps it is a good thing that NBC aren’t going to renew it for a fourth season, but it still gave us one last brilliant episode. It wasn’t perfect, it lost a lot of steam, but “Hannibal” season three was solid and the series as a whole has been truly great.